ISABEL, Leyte – The National Commission on Indigenous People (NCIP) held consultations with Bajao community in Isabel, Leyte on post-Yolanda reconstruction and relocation plans. It was learned that eight months after typhoon Yolanda struck Leyte, they are still struggling as they try to rebuild their lives, have marked with continuous displacement and rampant poverty. To recall, Bajao people came to settle along a coastline of private land in Sitio Pasil, Barangay Marbel in Isabel, Leyte after they escaped the conflict and harsh living conditions in Mindanao in 1990’s. Their sources of income in Isabel are fishing and selling used clothes in the town’s market. The Bajao people are the most disadvantaged indigenous groups, with high illiteracy and unemployment rates and low income. Traditionally, have been sea dwellers, living on narrow boats and visiting dry land only to trade fish, pearls and sea cucumbers for rice, drinking water and other staples. Although many of them were forced to adopt sedentary lifestyles, however, their unique way of life is still strongly linked to the sea as their income largely depends on fishing and free-diving, which means they inhabit the shorelines where they build houses on stilts. 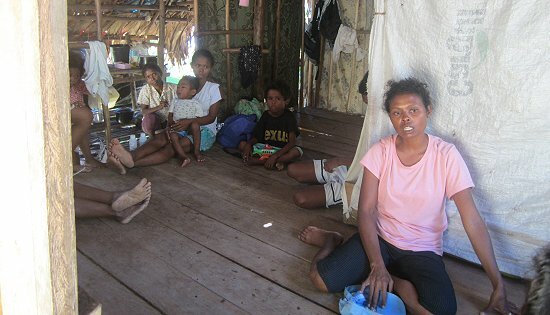 According to Hazel Torrefiel of NCIP, they are trying to look into the welfare of the Bajao Tribe, after the storm, they were forbidden to rebuild their homes by the land owner and the local government for the very reason that the coastal areas or unsafe zones were initially designated as 40 meters ‘no build zone’ and later downgraded to ‘no dwelling zones‘. It was learned that the 75 Bajao families were temporarily permitted to stay in an adjacent private land, with no legal rights and no security of tenure. NCIP discussed proposed relocation plans with members of the Bajao community and to help relay their messages to local authorities. “The Bajao were reluctant to move since the relocation site was too far from the coastline and the towns market where they make their living,” Torrefiel said. Torrefiel stressed that special attention should be given to indigenous people. In terms of shelter and relocation, taking into account indigenous people culture and maintains their traditional way of life. And for the Bajao according to Torrefiel, their culture is intrinsically linked with the sea and the shoreline and disaster response measures should be sensitive to their culture, tradition and beliefs. SUNNYVALE, CA – Battling estimated sustained winds of 145 mph and gusts to 175 mph, with waves over 45 feet, a Liquid Robotics Wave Glider® ocean drone positioned directly in the path of the storm successfully navigated and continuously collected weather data through the eye of Typhoon Rammasun (Category 5), one of Asia's biggest typhoons in 40 years. Conducting a meteorological mission in the South China Sea, the Wave Glider was deployed for a week prior to first encountering Rammasun's path on July 17th. With seaports and transportation systems closed in multiple countries and caught squarely in the typhoon's path, the Wave Glider was remotely piloted through the storm collecting and transmitting vital and rare, real time wave, temperature, conductivity and current data all from the surface of the ocean. Collecting current data to 100 meters and full directional wave spectrum data, this encounter gives scientists a unique picture of the horrific surface conditions during this type of event. Until the invention of the Wave Glider no vehicle could travel through and survive typhoon/hurricane class storms to collect surface data without severe risk to human life. "Our mission in building the Wave Glider was to build a surface drone which could persist in the ocean for very long periods of time despite the ocean's harshest conditions," said Roger Hine, Founder and CTO of Liquid Robotics. "There is no truer testament to the Wave Glider platform than the persistence of its sensor payload through one of the most catastrophic storms in recent history." "There is no other method to study a storm of this magnitude from the surface of the ocean without an extreme high risk to human life," said Gary Gysin, CEO of Liquid Robotics. "Scientists require this surface data to improve storm prediction models and early warning systems. The loss of life and property destruction from Typhoon Rammasun have only strengthened our resolve to instrument the ocean while our hearts are with those affected by this monstrous storm."